Lukas Schubert, pictured celebrating his goal against Dundalk at Oriel Park last season, could be set for a return to Derry City his week. LUKAS Schubert insists he’s ‘hopeful’ of finalising a deal which will see him return to Derry City for the 2017 Airtricity Premier Division campaign. The affable Austrian midfielder has turned down several offers from First Division clubs in his home country and is ‘positive’ he can agree terms on a new contract with the ‘Candy Stripes’ later this week. Schubert, who joined Derry in May last year and scored four times in 16 appearances, says he’s agreed on the financial part of the contract but wants to iron out personal terms before signing on the dotted line. “I had a really nice break but it was long so I’m looking forward to returning to the pitch to play again,” said the 27 year-old Austrian. “The deal is not through yet,” he confirmed. 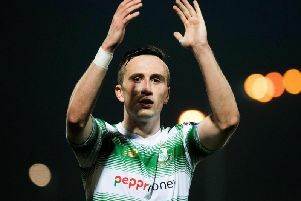 “There’s still some things to sort out but I think Kenny (Shiels) has been in touch with my agent. It’s just little things. Money-wise, we are agreed -it’s what Derry can afford. It’s just a few personal things I’m waiting on. Once this is done I will look at flights to come back. “I’m positive it will work out and we will have an agreement very soon. Then I will be on the plane coming back,” he continued. “It’s a real possibility but it depends on Derry. I’m positive it will work out and we will have an agreement very soon. Then I will be on the plane coming back. It’s a real possibility but it depends on Derry. It’s always difficult for a foreign player to adapt to a new country but Schubert quickly became a fans’ favourite at Brandywell during the second half of last season. And he claims the fans and manager, Kenny Shiels, played a big part in his decision to agree on a return to Foyleside. “I enjoyed my time last season and one of the main reasons I want to go back was because the fans and the people were so nice to me at Derry. “And of course because I can learn a lot at the club. One of the other main reasons was because of Kenny and the team. We had a great changing room as well. It was great to be a part of the success we had last year. Kenny had a lot to do with that and the atmosphere of the changing room was also very important in achieving success. “Obviously Cork and Dundalk have a much bigger budget and probably the better players, individually, but we had a very good collective. No matter who played, we were one group. That was very important. One of Schubert’s undoubted highlights of last season was scoring his debut goal against Longford Town in the 4-0 win at Brandywell last July when he jumped into the Southend Park stand to celebrate with his girlfriend and friends who made the trip over from Austria. And so he’s hoping he can agree terms this week and help Derry improve on last season’s successful campaign.